There’s no doubt that you’ve heard of these three myths about fire safety; protect yourself by erasing these misconceptions from your mind. Everyone needs a fire protection plan. Because they’re so vital, it’s not surprising that a lot of information surrounding these plans can end up being common rumors. 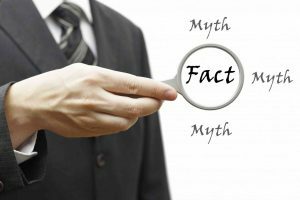 However, in order for you to have a proper fire protection plan, you need to bust a few myths. There’s no doubt that you’ve heard of these three myths about fire safety; protect yourself by erasing these misconceptions from your mind. Myth #1: All sprinklers go off at once. Fire sprinkler systems are great ways to prevent fires, for both commercial and residential buildings. They are triggered by a piece of metal holding back the trigger, and the that melts at a certain temperature. The common myth surrounding this protection system is that all the sprinklers go off in the building once one is triggered. However, most fires can be contained and dealt with using only one sprinkler. Sprinklers are triggered per room, not per building. Myth #2: Newer buildings pose less of a risk. All buildings have the potential to be damaged by a fire–but, as it turns out, newer buildings may actually be more likely to ignite fatal fires. They contain much more insulation, which is extremely flammable and gives the fire fuel. However, most fires are started by human carelessness. When you’re making a fire safety plan, never judge how extensive it should be based on the age of the building in question. Myth #3: People die in fires because of burns. The top reason for fatalities in fires is smoke inhalation. Fire needs oxygen to burn, meaning it takes oxygen from the air and replaces it with smoke, which we can’t breathe in. Eventually, this suffocates someone to the point of death. For the most part, even if someone escapes a fire without any burns, they could still suffer significantly from smoke inhalation. Judd Fire wants to help you build the best fire protection plan! This entry was posted on Monday, May 1st, 2017 at 2:39 pm. Both comments and pings are currently closed.